Royal Navy warships conducted a formal wreath-laying and memorial service over the war grave of the newly discovered last resting place of the WWII Royal Navy Destroyer HMS Hunter on Saturday 8 March 2008. The Exercise Task Group of 21 ships, which have been taking part in Exercise Armatura Borealis 08 off the north west Norwegian coast, steamed over the wreck in formation. HMS Albion, HMS Bulwark, HMS Cornwall, RFA Mounts Bay and NOCGV Andenes crossed the site of HMS Hunter conducting synchronised ceremonies on their decks. The ships then turned in formation before conducting a 'Steam Past' of the Flag Ship. The procession of warships from the Royal Navy showed their respects by laying wreaths and toasting the fallen by the traditional Navy method of pouring a tot of rum over the side. Led by the Flag Ship HMS Albion and attended by Vice Admiral Reksten, Royal Norwegian Navy, and Major General Garry Robison, the Commandant General Royal Marines, the formed line of ships sailed over the spot where HMS Hunter lies 305m below. Two of the youngest members of the ship's company aboard HMS Albion, 17-year-olds Engineering Technician Joe George and Able Seaman Warfare Specialist Yasmin Thornton dropped the wreath over the side on behalf of the ship's company. In traditional form, with signal flags, Albion flew the last order of Captain Warburton-Lee, the Commander of the 2nd Destroyer Flotilla who died leading the naval attack: "Continue engaging the enemy." As the Royal Navy sailed from the fjord for home, it signalled back by Morse "Farewell, we'll meet again." HMS Hunter had remained undisturbed for 68 years until the Norwegian Mine hunter HNOMS Tyr located her last week, using her echo sounder. On dispatching a remotely operated submersible to investigate, it became clear that this was the long lost HMS Hunter, the submersible locating and filming the ship's crest. Over several years the Norwegians have identified all the other sunken ships involved in the battle, yet HMS Hunter remained elusive until this week. "We went to the area where we thought it was most likely to lie and found the wreck after about 14 hours searching." Norwegian officials confirmed with the British Embassy on 1 March 2008 that they had located the wreck of the H class Royal Navy destroyer, sunk in action with the German navy in 1940 after bravely fighting during the Battle of Narvik; an action that would result in the first Victoria Cross of WWII being awarded. 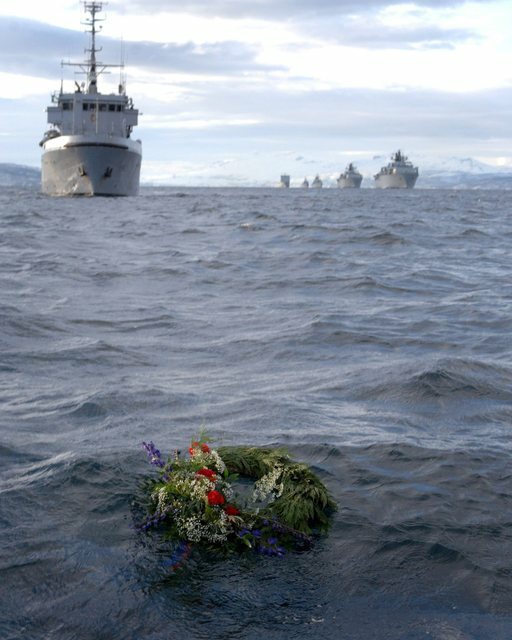 Of the 145 crew on board, 110 sailors from the ship lost their lives when the ship slipped into the deep waters to rest 305m (1,000ft) down on the seabed near Ofotfjorden. 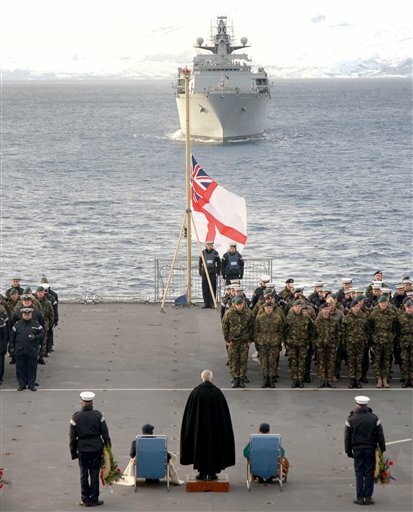 The Commander of the United Kingdom's Amphibious Force, Major General Garry Robison led the marks of respect from HMS Albion in a joint ceremony at 1600 local time on 8 March 2008, almost 68 years to the day since the ship went down at 0530am on 10 April 1940. "It's rather surprising that the ship that's been looked for, for so long, 68 years now, has finally been discovered here in this Fjord whilst we've been here on the exercise. "It was a very moving ceremony that we had this afternoon, with all the ships in the exercise taking part. And we were able to invite our Dutch and our Norwegian colleagues to join us. It was most moving. "It was a great honour for us to be able to invite local Norwegian veterans to come. Very sadly, we were not able to bring over the three United Kingdom Royal Navy veterans that served on HMS Hunter. But we shall certainly take the opportunity to let them have the films and the photographs of that ceremony today. "My message to the veterans was that I'd like to think we paid an appropriate and fitting tribute to their colleagues and that we paid HMS Hunter the very best respects that we could in our moving ceremony this afternoon. "We have previously trained in Norway almost each year. But with the busy operational programme that the Royal Marines and the Royal Navy has, we've been able to do that less often. It's nice to be able to come back and exercise what we as Royal Marines consider to be our core amphibious skills in what is a very challenging environment. "What this exercise has allowed us to do, is work in a very challenging and demanding environment. The other thing it's given us has been the opportunity for team spirit and team skills to work together as they build up to what is going to be another very important and challenging operational deployment as 3 Commando Brigade goes back to Helmand Province in Afghanistan later this year." Back in the UK, several survivors were notified of the discovery and have given their reactions to the find. "I am so pleased and overwhelmed to know that after so many years HMS Hunter has been found and my fellow shipmates have a known resting place. I'm so sorry not to be able to go to the wreath-laying, but I will be spending a quiet time at home with my family and thoughts. Also my daughter in Cornwall will be laying flowers at sea for me dedicated to my shipmates." "I would like to thank the Norwegian people and the Royal Navy for their very kind tributes following the discovery of my old ship," he said. "I have mixed emotions about the events from over 68 years ago and the loss of so many of my fine friends. I now have a great sense of relief knowing the final resting place of my comrades and our ship." 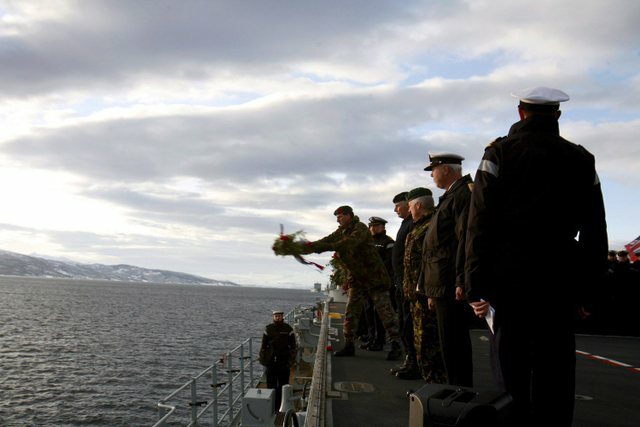 In this photo provided by British Royal Navy, officers and men of the British and Norwegian forces participate in a wreath laying ceremony above the sunken WWII British warship HMS Hunter during a memorial service for the lost souls, with more than 1000 British and Norwegian military personnel present during the service in the Ofotfjord, off Narvik, Northern Norway, Saturday, March 8, 2008. The British Royal Navy destroyer, HMS Hunter, was sunk by the German Navy, April 10. 1940, and was discovered by chance during military maneuvers on March 1, 2008, in the Norwegian fjord. 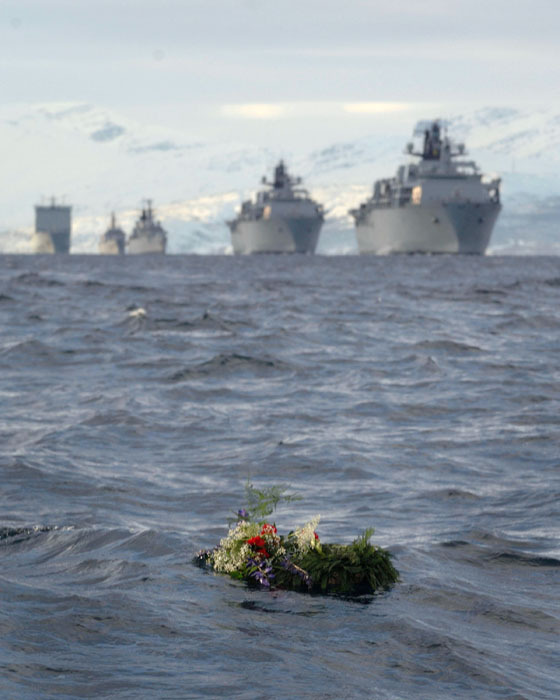 In this photo provided by British Royal Navy, Navy boats participate in a wreath laying ceremony above the position of the sunken WWII British warship HMS Hunter, as a flotilla pass by the war grave during a memorial service for the lost souls, with more than 1000 British and Norwegian military personnel present during the service in the Ofotfjord, off Narvik, Northern Norway, Saturday, March 8, 2008. 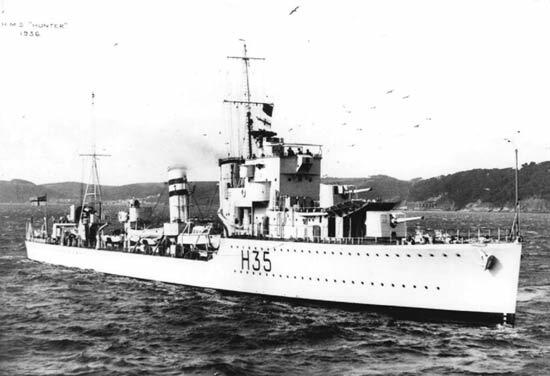 The British Royal Navy destroyer, HMS Hunter, was sunk by the German Navy, April 10. 1940, and was discovered by chance during military maneuvers on March 1, 2008, in the Norwegian fjord. 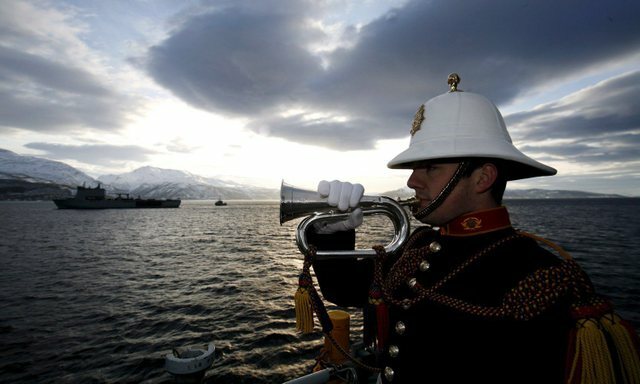 More than 1,000 British and Norwegian soldiers were present during the HMS Hunter memorial service in the Ofotfjord, off Narvik, Northern Norway, 08 March 2008. The wreck of the Royal Navy destroyer, sunk by the German Navy, 10 April 1940, was discovered March 1 in the Norwegian fjord. 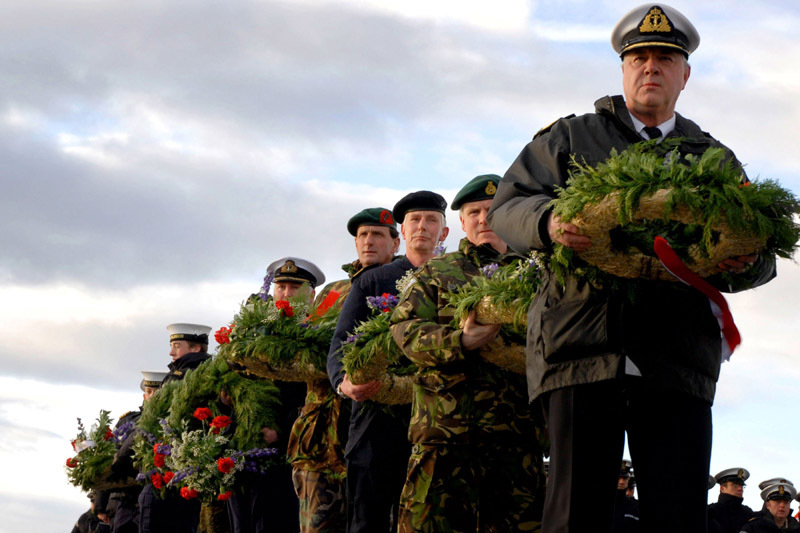 Handout photo released on 08 March 2008 shows Royal Navy warships conducting a formal wreath-laying and memorial service over the war grave of the newly discovered last resting place of the WWII Royal Navy Destroyer HMS HUNTER, 08 March 2008. 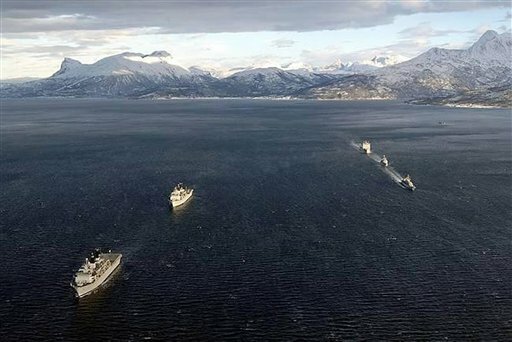 The Exercise Task Group of ships steamed over the wreck in formation have been taking part in Exercise Armatura Borealis 08 off the North West Norwegian coast, supporting up to 1500 men of 3 Commando Brigade Royal Marines ashore conducting Arctic survival training.